ALL FACE AND BODY PAINTS ARE APPROVED BY THE FDA (U.S. FOOD AND DRUG ADMINISTRATION). PAINTS ARE MORE EFFECTIVE WHEN THEY ARE USED SAFE AND PROPERLY AS THE INSTRUCTIONS FOLLOW. WE DO DO NOT RECOMMEND USING PAINTS ON ANYONE UNDER THE AGE 3, OR WITH A PRE-EXISTING SKIN CONDITION. FACE PAINTS CAN BE REMOVED WITH MILD SOAP AND WARM WATER, OR BABY WIPES. SOME COLORS MAY LEAVE SLIGHT TEMPORARY COLOR IF LEFT ON FOR TOO LONG. WE HOPE YOU ENJOY YOUR SPECIAL EFFECTS WITHOUT AFTER EFFECTS! Fabulous Faces is not liable for any allergic reaction to paints and cosmetics used. Reputable, suitable, FDA approved paints are used at all times. 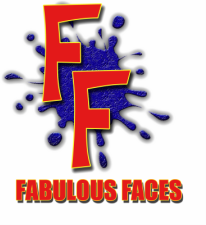 Fabulous Faces reserves the right not to paint anyone who is thought to be unwell or suffering from Eczema, Cold Sores, Conjunctivitis, or other skin conditions. A clean sponge/brush is used for every face and brushes are cleaned regularly between faces as well as clean & fresh water through out the duration of the event. Fabulous Faces can not be liable for clothing. If there is a splash or the child rubs their face on their clothes, it is advisable to soak the clothes in cold water or spraying with a stain remover before washing as soon as possible for best results. On occasions we may ask to take a photograph of your child's face for advertising purposes. We will always ask for permission and ask you to sign a consent form.